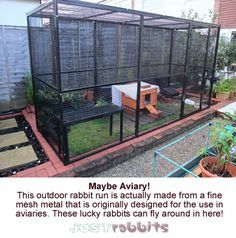 Posted by Jon in Rabbit Care Information on Sunday 30/10/2016 17:04 UTC. 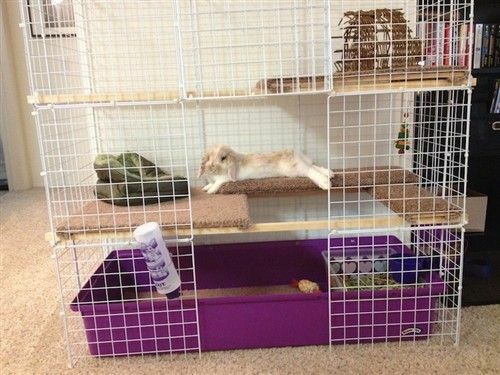 « So Your Thinking Of Getting A Rabbit…..
Why Do Rex Rabbits Require "Special" Housing? The breeds "mini" rex and "standard rex" were orignally bred for their fur. The fur is a special short dense structure that often feels like plush or velvet ( and was orignally a genetic mutation!). Today rexes make wonderful pets. They are an active, intelligent and curious breed that will live a decade with dedicated care. Rexes need special housing because they are prone to a condition called " Sore Hocks". This special short fur makes it easy for the fur on the hock, the underside of the foot, to become "worn" away. As the fur subsides it leaves the skin vunerable to friction burns as the rabbit moves. These burns can progress into bleeding wounds and if left infected or open, can even progress to serious bone infections. 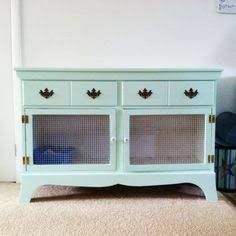 Provide a hutch/ indoor house that is large enough and well padded? 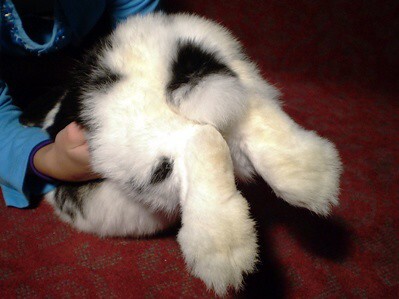 Frequently check the underside of the rabbits feet to check for signs of sore hocks? Make sure you have a vet that is rabbit savvy? Trim rabbit nails yourself or by a professional often? 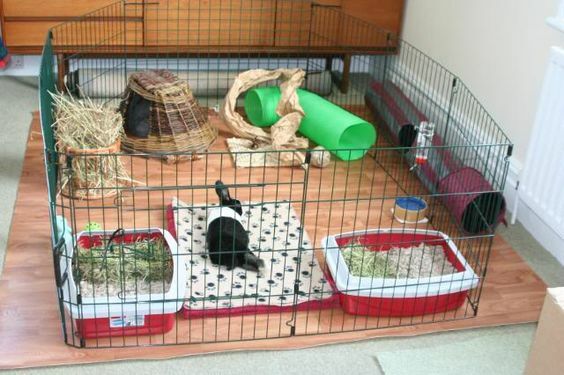 Provide plenty of toys and activities to do for your rabbit? Make sure that your rabbit has a friend if alone? Below are images of rex rabbits with sore hocks. Flooring. 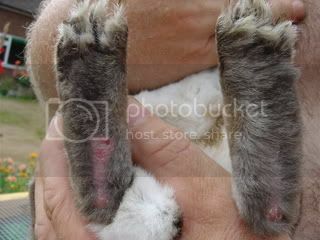 These rabbits CAN NOT be kept on concrete, plastic & wire flooring This type of flooring causes the rabbits foot to rest unnaturally and not flat causing the sores. Instead, consider wood, tile or lino , the more padded and less slippy the better. Bedding. Making the flooring as soft and as close to earth is recomended. These rabbits benefit from a bed of hay and shavings. They also benefit from soft padding on lino flooring such as carpet off-cuts. Bedding MUST be kept clean to prevent the feet from becoming wet and more prone to matting. 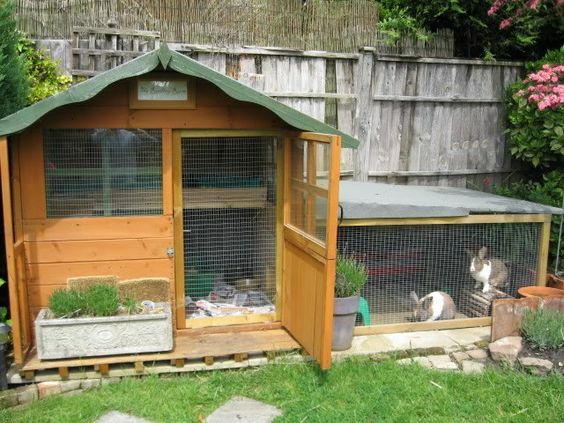 The Hutch and run must be protected from the elements to prevent dampness. From what I've seen personally, a lot of rex rabbits are diggers. So it causes a problem when you don't want your garden dug up or to be chasing a rabbit around the garden. An idea is to put the run on concrete but to add soil on the bottom. This way the rabbit's feet are protected as well as your lovely lawn. The run has a base of bark chippings, good for rex feet as well as for digging! 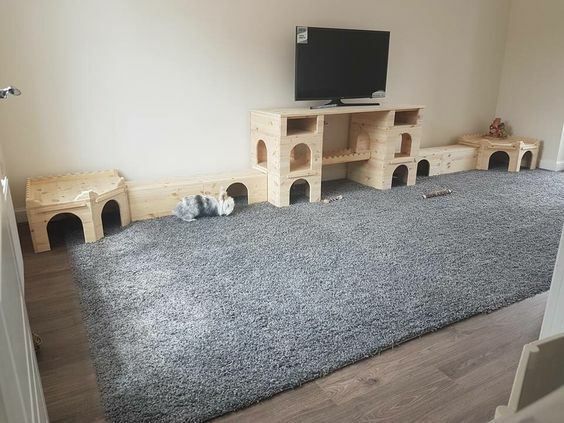 Plenty of toys and tunnels to play with! Rabbit needs a rabbit friend! Flooring. Plastic and short carpet are NOT RECOMMEND. 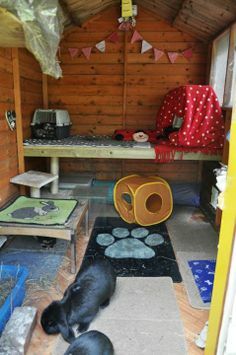 Instead have a wooden indoor hutch rather than a plastic one. Use deep pile carpet which is more softer. Or use wooden / laminate / lino flooring with carpet offcuts/ rugs. Soft, deep padding on levels is great for bunny feet! Lots of toys to keep busy! Lots of things to keep the rabbit busy! Not many pointers to be honest! By making sure you monitor your rabbits behaviour and health, you can prevent sore hocks. By keeping your rabbits nails short, you are stopping the rabbit from putting all its weight onto its hock and therefore creating more pressure. Make sure your rabbits nails are trim at all times. 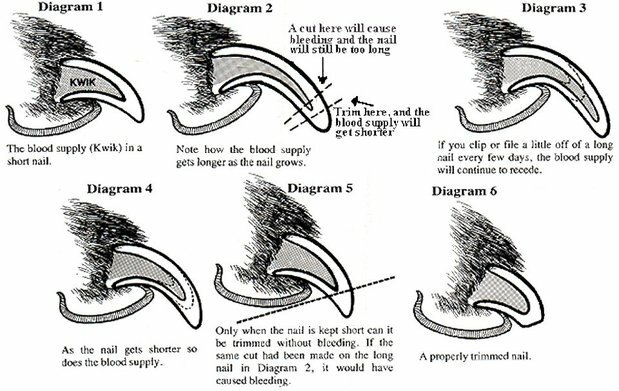 If you are not confident at trimming claws make sure you know someone or get a professional such as a vets to do it for you. Below is a diagram of how to cut a nail whilst avoiding the kwik, if caught the rabbit will bleed and loose trust. The more the nail is trimmed, the more the kwik recedes in time and the nail can be kept shorter. Good hocks look like these above. Plenty of fur growth around the whole foot. The feet are clean and the nails are trim. 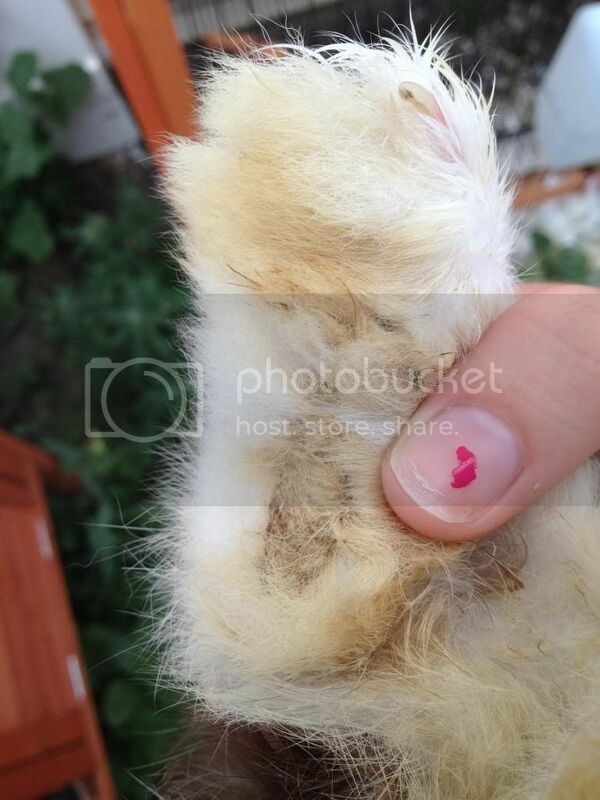 Stage 1 - The fur on the hock may be beginning to recede and the skin is exposed - A small pink centre may be seen. At this point no action needs to be taken. But it is recommended that you take a look at your hosuing and make sure there is more padding. Stage 2 - The pink circle becomes more darker or inflamed. At this point action must be taken before it gets worse. 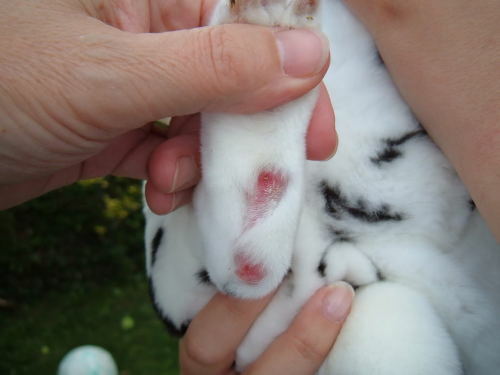 Seek your vet who may apply anti-inflammatory ointment / powder and may even bandage the foot up. Stage 3- The area will continue to look inflammed and may begin to swell up, bleed or become full of puss. At this point the rabbit MUST seek veterinary attention. The aim wasn't to put you off, but to make sure you are educated in the responsiblity you may be taking on. 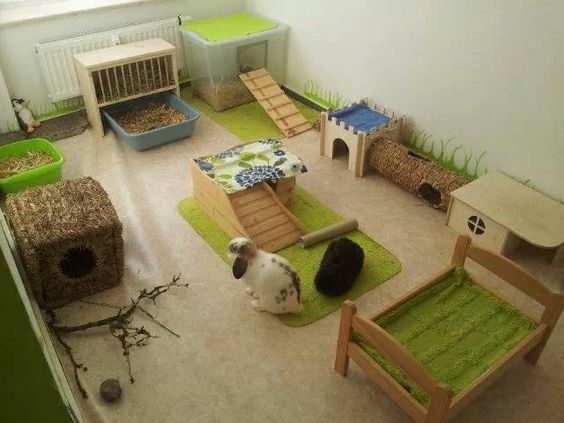 After all, a rabbit may be in this situation becuase their previous owners did not do their home work. Please consider adopting a rex from us, they make great, loving companions and will keep you entertained for hours!